A must read for those who want to be up to date on what’s happening. 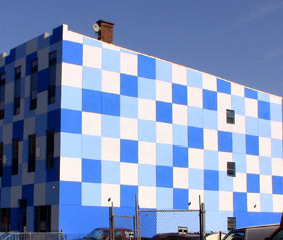 The Observer picked up on story originally reported by Jonathan Mena for Bushwickbk.com in Brooklyn about this checkerboard building on Palmetto Street between Bushwick and Evergreen Avenues. Mena formerly wrote articles and columns and produce YouTube mini-docs and broadcast reports for the WORD. He has been stringing for Bushwickbk.com in Brooklyn for many moons. As I sat listening to Obama’s phone conference call with the WORD and 114 other student journalism organizations last week, I wondered if any of my other student journalism colleagues from around the country were ready to bite his head off (figuratively speaking, of course) with tough questions. Sadly, only three were selected – perhaps, dare I say, pre-selected — and they seemed trapped in the Obama vortex and were star struck, to say the least. The representatives of the age groups that got recognitions for coming together and helping the President trounce McCain, failed to take a risk and grill him. 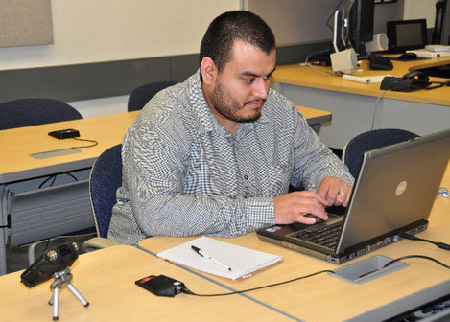 Jonathan Mena, a former WORD Senior Editor-Producer, posting information on Facebook during the September 27, 2010, conference call. ICIT's Distance Learning, for whom Mena now works, made possible the WORD's participation. Mena officially graduates this semester. You are currently browsing the The WORD Blog blog archives for October, 2010.